The New WINSTON BORON III TH-MS MICROSPEY® rods are an innovative addition of three (3) specialized light line Two Handed trout models to Winston’s extremely popular Boron III TH Two Handed rod series. With our Boron III technology, these new high performance two-handed rods perfectly combine the power of a spey rod and the finesse of a trout rod to bring a whole new dimension to fishing big, open trout waters, landlocked salmon and smallmouth bass in moving water. The versatile design of these new 3-, 4- and 5-weight Microspey® rods strikes an important balance between “castability & fishability”. The new TH-MS Microspey® series includes a 10 1⁄2’ 3-weight (270 grain), an 11’ 4-weight (330 grain), and an 11 1⁄2’ 5-weight (390 grain). These rods are designed to utilize the incredible high performance of Boron III technology, driving power up through the rod as the angler may need. Whether fishing in demanding weather or covering broad waters, these Boron III TH-MS Microspey® rods will provide the angler with an exciting new world of opportunities. While smaller than our stronger Boron III-TH rods, these new ultra lightweight Boron III TH-MS Microspey® rods are powerful enough to launch a streamer into a stiff wind, nimble enough to handle light tippets when fishing wet flies, and also when dead drifting nymphs or dries when in use as a longer “switch” rod. Though light enough to fish all day, they’re long enough at 10 1/2 – 11 1/2 feet to reach those far seams that call for a big foam bug. In short, there is a Boron III TH- MS Microspey® rod for almost any fishing situation. Finished in our beautiful Winston green, these new Boron III TH-MS Microspey® rods have an 11-inch two handed grip that is tailored to feel like a trout rod grip rather than a full spey grip. 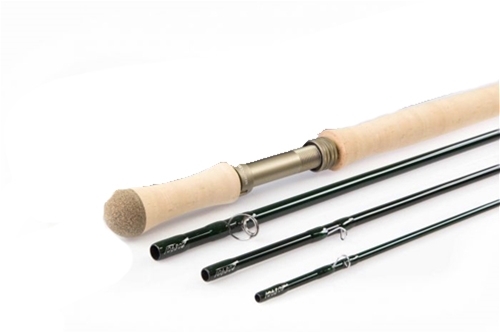 The rods come with an anodized aluminum Winston reel seat and a 3 1⁄2-inch bottom cork grip. They also use slightly larger chrome guides than typical trout rods and a larger tiptop allowing for the larger diameter of the spey style lines. As with all two handed rods, matching fly lines with these new Boron III TH-MS Microspey® rods is critical to optimizing their feel and power. Winston Pro Advisor and Two Handed casting specialist, Tom Larimer, worked closely with us as we developed these new rods and to ensure that the rods and lines perform to optimum effectiveness and enjoyment (i.e., success!). Amazing new two handed Microspey® light line design. New category for two handed rods...expands two handed casting into trout fishing. Built with advanced Boron III technology, resulting in a fast action rod that is extremely lightweight, powerful, lively and capable of generating incredible line speed. Proprietary design that promotes effortless long casts, accurate presentations and reserved power in a variety of trout fishing situations. Well-balanced to enhance line delivery and limit casting fatigue. Winston designed grip to support infinite hand placement with any casting style. Handcrafted in Twin Bridges, Montana USA.